I'm really drawn to more stones in my work, which means more stone settings. 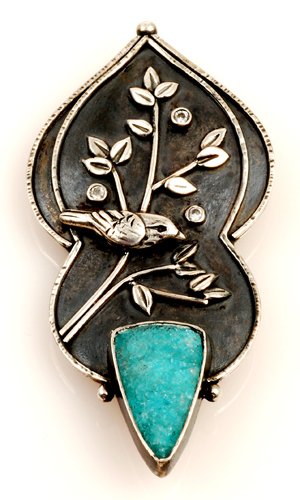 I love the look of bezel set stones, where a piece of metal is pushed over the entire perimeter of the stone to hold it securely in place. The easy approach to bezel settings is to use a pre-formed bezel cup. These commercial components can be embedded into metal clay, soldered to fabricated metal, or fused into place onto Argentium. The cups are pressed from very thin metal, usually 32 gauge, which makes them very easy to close over the stones but also weaker and less of a visual statement in the work. 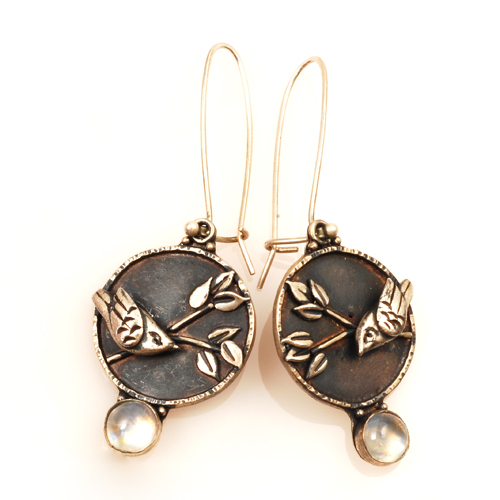 You can barely see the edge in the Full Moon earrings above. Such thin bezels are also useless for masters to be molded for casting because the wax will be too thin for good metal flow. The more complicated approach to bezel settings is fabrication. A strip of thin metal, either purchased bezel strip (usually 28 gauge) or heavier sheet, is formed to the exact shape of the stone to be set. While the seam is usually soldered, Argentium offers the advantage of fusing the seam. Since solder always tarnishes first, a soldered seam becomes quickly visible, whereas a fused seam stays invisible. While round bezels are easy to form with a mandrel, other shapes of stones require more fuss and experience. 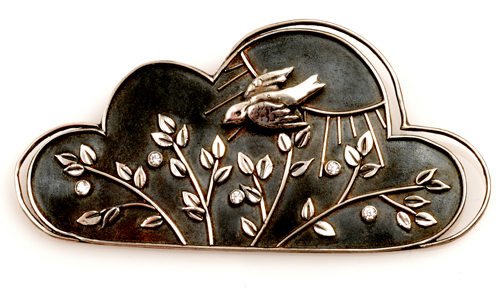 The hemimorphite druzy in my Bird Song brooch was made from 24 gauge sheet. Tube setting is another straightforward type of setting, where short lengths of purchased or custom fabricated tubing are cut to length and soldered or fused into place. A seat to hold the stone is cut with a bur into the thick wall, and then the lighter remaining metal is pushed in over the stone to hold it firmly in place. This method is often used for tiny stones, and I've been purchasing a lot of 2 mm stones for this purpose. My cloud brooch has five white CZs, and I actually purchased a few diamonds to use in a special piece. Thanks, Janet! This is my favorite series of work right now.